THE WRITING BUDDHA - Opinions | Books | Movies: Why Chetan Bhagat's comments weren't totally wrong in Nach Baliye-7!!! 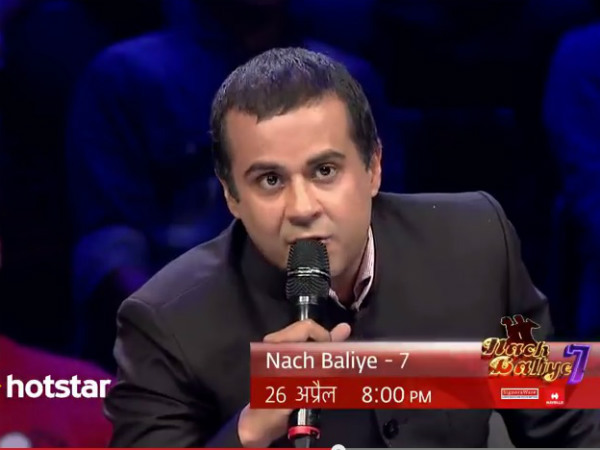 Why Chetan Bhagat's comments weren't totally wrong in Nach Baliye-7!!! This Sunday, I reached home quite late because of which watching the IPL match wasn't a good option. That's the problem with T20 games. Either watch it from beginning or you cannot relate with it. I asked my mother to watch whatever she wants to. She continued watching Nach Baliye 7's first episode which she was already watching before I entered in her TV space. It suddenly stuck me that Chetan Bhagat is one of the 3 judges on this dance reality show. As I have been following him from a long time, I thought of watching it and see how is he doing on his 3rd show on television after the one which he hosted on ABP News and another where he was judge on the same channel. I was happy to see him being straight-forward and not telling everyone that their dance was superb like Preity Zinta. He wasn't trying to be sweet forcibly. But I was shocked when he commented on a couple after their performance for something which was a backdrop to their relationship. The guy told how they have run away from their home without telling their parents and it's all right according to them. Chetan Bhagat sued him badly and asked what would be his reaction when he comes to know one morning that his children have run away as well. Similarly, another couple when told that they are looking forward for their parents' approval on their relationship through this show, Chetan Bhagat asked them how will they feel if their child will be on television and telling them that they are in relationship in front of the world. The neighbours, relatives and society will watch the same with you and laugh at you for something you aren't responsible for. Well, it was really awkward to find Chetan Bhagat grilling them for this in a dance reality show but what he was saying wasn't wrong and I fully support it. In our Indian society, we try to forget its reality to play cool but some day, we know we are going to fall in its hands and die a bad death. We know that our relatives and neighbours have nothing to do with our marks but still we hide when we get a drop in Engineering or failure in boards. It is always great to say that I can chose my own partner with whom I would like to marry with. It is also cool in saying that how could I marry a stranger which is what my parents want in the form of arranged marriage; its better to marry with someone I know i.e. my best friend or my lover. This is something that we repeatedly say because we know somewhere we are crossing the boundary set by our parents and the guidance given to us since we were in school. When one comes into TV and glamour industry, they tend to forget their village, home, family values and everything. They get so lost in these spotlights and fast life that they feel everything they are doing is right because they are in their way of conquering Mumbai- the city of dreams. They don't realize that their activities can cause very big problems for their fans which they have earned over time. They try to repeat what their idol is doing and therefore end up following the path which brings them in a trap that either leads to suicide or flying away from home never to return back causing humiliation to parents. These celebrities have different culture where they do not have any problem in seeing their partner dancing and smooching with someone else in movies because they call it work. They do not have any problem in having extra-marital affairs because they feel it's everywhere in the society because everyone around them in INDUSTRY is doing the same. Chetan Bhagat is a common man who have taken education in IIT and IIM and worked as a banker for 11 years. It's only because of his writing talents and great marketing skills that he has reached a level where he works with these Bollywood guys shoulder to shoulder. But still his values lies back from where he comes. Hence he cannot relate with the stories these celebrities share with him. He finds it awkward and annoying. Therefore, what he was preaching these couples was a reality of Indian society which has to be taken care of. You cannot say in which century is Bhagat born just because he is speaking against dating-shating-mating-marrying and then informing parents about your pregnancy. Remember, you are the first person who gives example of such boys and girls whose stories are out in society to tell your parents how good are you just because you haven't attempted that. But later on, when you go on the same path, you think your parents are wrong but you are right just because you are in this thing called LOVE! Well! Now coming on to why it was little weird to hear these things from Chetan Bhagat. First of all, he was being very rude to such couples. He could have explained it in sweetness the way he gives his seminars to youngsters in their colleges. May be director of the show must have asked him to be a rude one to bring versatility in the character of judges but still, it was really TOO MUCH. Secondly, Chetan is a romantic writer himself and what he writes in his book is what these couples have done. Yes, you do not end your books at marriage, it's just that these couples have gone a step ahead. Because what you say is not the last word. Every person has his/her choices too. Just because your books do not discuss marriages in the climax does not mean every affair should end as an affair itself because they didn't get to know what Chetan Bhagat believes in. You have yourself written 2 States where you have shown how the parents are against that marriage. Why in the first moment itself you didn't plot boy breaking up with the girl knowing that the mother of Krish isn't interested in giving her son away in an inter-caste marriage to a South-Indian family? You yourself went on narrating how parents are getting madder and madder but still the protagonists go to the last level where the parents have to forcibly agree to bind the two lovers together. Are you trying to say that love-marriage is good but only if its done by making parents come on their knees and accept the decision of their children? That's wrong. Even in your latest book- Half Girlfriend, you have shown how a girl agrees to be with a boy who have used a sentence "Deti hai toh de, warna kat le" at one point of time. Either you write books where romance, love and love-marriages are shown in bad light or do not talk of something like this in a national reality show which is watched by almost everyone. Coming to the end, I would like my readers to forget the preacher for once and concentrate on the subject only. For what he sued the couples is something a couple is sued for all their life by every elder whenever they tell how they have run away from their home or married against their parents' will. So do not judge Chetan Bhagat and do not get personal at him. Try understanding the reality and practicality behind his message that he is trying to give. But Chetan Bhagat, even you don't show double standards. Stand on one boat or remember, you will sink too badly and that won't be too much for us. Yes! That's all!